Moringa is a tree originally from India or Asia and is the only genus in the family Moringaceae, all of which are trees that occur in tropical and subtropical climates. There are 13 species in the genus, but the most common and widely cultivated species is Moringa olifera, which is native to the foothills of the Himalayas in Northwestern India. It is being cultivated in Santa Maria Huatulco and is now locally available as a nutrient supplement, and is well adapted to the local climate. You can find capsules at Bioamigables next to Photo Conejos. Or venture out to the neighborhood of Erradura, on the outskirts of Santa Maria Huatulco, where you can buy products directly from the rancho. 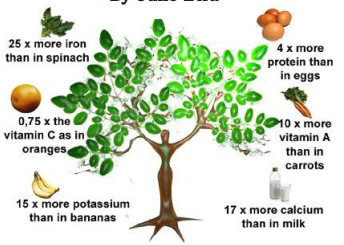 Miracle Moringa has multiple medicinal properties depending on the part of the plant used, and is considered to be an all-around good health remedy. It has long been used to treat a variety of different ailments in indigenous medicine, particularly in South Asia. It can be a good source of protein and contains essential minerals, vitamins, betacarotene, and amino acids. All parts of the plant are useful including the roots, seed, bark, fruit, flowers and immature fruits (pods) although the leaves are most popular. Claims for multiple medicinal properties can be found in the scientific literature, which include cardiac and circulatory stimulation, anti-tumor, anti-inflammatory, anti-ulcer, anti-spasmodic, diuretic, anti-hypertensive, cholesterol lowering, anti-diabetic, anti- bacterial and antifungal activities. Yikes, it can do everything. And if you look on line to purchase dietary supplements, suppliers will tell you it does even more: promotes healthy digestion, heightens mental clarity, increases energy, provides natural anti-aging benefits, enhances the body’s immune system, regulates blood glucose levels, and promotes healthy circulation. They claim it has twice the protein of yogurt, seven times the carotene of carrots, three times the potassium of bananas, seven times the vitamin C of oranges, and four times the calcium of milk. My neighbor Larry Woelfel planted a tree he bought from Marcus (Vivero La Ceiba in Crucecita) at the Organic Market a few years ago. He makes a tea from dried leaves, and uses the raw leaves in salads and sauces. He claims the taste is mild and not bitter, that it adds a nice seasoning, but he has not noticed any improvement in his cognitive abilities following consumption.